Beatrice and Virgil [Book Review] – my books. my life. I read Beatrice and Virgil almost two months ago. I may be behind on reviews but I generally manage to get one up by now. I have struggled with what to say about Beatrice and Virgil. I’m still not sure what I think about the book. But review it I must, so here you go. “Beatrice: Describe a pear for me. What is a pear like? Virgil: (settling back) I can try. Let’s see…To start with, a pear has an unusual shape. It’s round and fat on the bottom, but tapered on the top. And Virgil continues to describe the pear (“A pear tastes like itself”), realizing how difficult it is to describe something that you have never experienced (not: I think I may have just had an epiphany about the novel while writing that sentence). But Virgil, and Martel, do a fairly good job of describing a pear. Let me tell you a little about the plot. 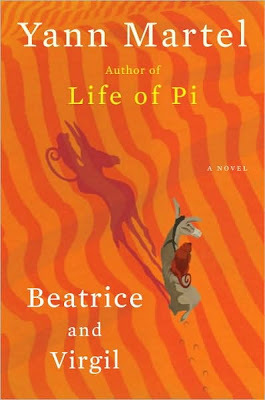 Beatrice and Virgil is the story of Henry, a writer who had a successful first novel about animals (Life of Pi, anyone?) but found himself unable to write anything else after publishers tore apart his idea of writing a flip book (nonfiction on one side and fiction on the other) about the Holocaust. A taxidermist sends him some pages from an old story and the two meet. The taxidermist, also named Henry, has written a play about a monkey and a donkey, Beatrice and Virgil respectfully, who are stuck in a Godot-like setting where not much seems to happen except a lot of conversation but is really much darker. I adored the parts of the novel that were passages of the fictional play. I think Martel may have a future as a playwright if he so chose. But the actual novel was just…strange. There is an unfortunate incident with writer-Henry’s pets that seemed to exist solely to make me cry. The ending was sudden and not what I was expecting (I thought I had the twist figured out but I was very wrong). And why have two characters named Henry? I think I understand what Martel was trying to do with Beatrice and Virgil but I’m not sure he succeeded. The Holocaust is, and will probably always remain, a difficult subject to write about in a nontraditional manner. But Martel has succeeded in giving us a book that we continue to discuss and debate and dissect. A book that no one seems to quite understand. A book some people say is brilliant and others disagree. And for that reason, I would recommend reading it. I think. *The pages correspond to the e-book set to the publisher’s settings. They are probably not accurate at all if you have the print version. You have intrigued me! I am currently reading Life of Pi and I’m really enjoying it. I think Beatrice and Virgil will go on my TBR list right now. I wonder what Martel’s fascination with animals in books go. Obviously they played a large part of Life of Pi and it sounds like they play a part in this, too. Seriously, what WAS the the deal with the thing with his pets? I still don’t understand it. How was it supposed to have happened? Four months later and that novel still confuses me. Sometimes I have to go with how a book makes me feel and although this book was very disturbing at times, it shook me up and got me thinking. I’m not entirely sure I understood everything but it stayed with me for a really long time. When I heard Martel at the Festival of Books, he spent a lot of time discussing Pi, when I had expected him to discuss B&V. What he said was brilliant though and confirmed to me that he is a great writer. Beautiful review, Michelle! It looks like Yann Martel has written a ‘memoiry’ book 🙂 I loved the last three lines of your review. They summarized the book so beautifully. I want to read it and see what it is exactly that makes people react to this book in such a positive or negative manner.